Picking your first gun can be a daunting task. By the time you reach the gun store counter you’ve likely received more advice from friends and family than you can remember. Unfortunately, much of that advice might have been contradictory. Your Uncle Jim said to buy a revolver, the guy at work said to buy a “compact. 22”, your buddy from the gym said “get a Glock”. What’s a person to do? Question #1: What is your reason for buying a handgun? Is your first gun a recreational tool, one you’ll be using to practice marksmanship? Are you looking for a home protection gun, one to keep on the nightstand “just in case”? Will you be taking formal training and applying for a Concealed Carry Permit? 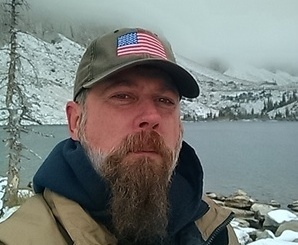 If you simply want to learn how to shoot and practice marksmanship a pistol or revolver chambered in .22LR (Long Rifle) is a good place to start. The .22LR cartridge is inexpensive, offers very little recoil (kick) and is relatively quiet when compared to larger cartridges. Handguns chambered in .22LR can be fantastic training tools. Should your first gun be for Home Protection, you will want to purchase a center-fire pistol or revolver chambered with a larger caliber, such as .380ACP, .38Special, 9mm Luger, etc. If your first gun is to be kept in the house for security, it doesn’t need to be all that compact or light-weight. A large gun that fits in your hands will feel better to practice with and is more easily managed. Lastly, if you are looking to purchase your first gun to conceal comfortably on a daily basis, size and weight are considerations. It must be kept in mind that small, lightweight firearms are less forgiving of marksmanship errors and more difficult to learn to shoot effectively. Those guns can indeed be mastered, but the shooter must be dedicated to training and practice. It does no good to carry a firearm for self-defense if you can’t hit an elephant at five paces with it. NEW!! Did you know that we now have digital training courses? 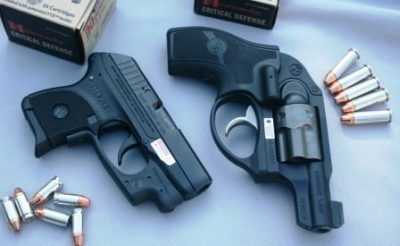 There are certainly a huge number of handguns available from numerous manufacturers. 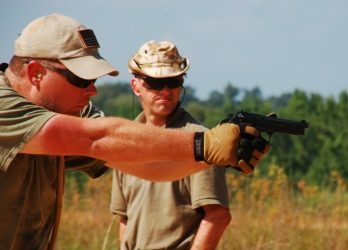 Handguns are comprised of three major component groups: the Barrel, the Stock/Grip, and the Action. The action causes the round to fire, the barrel directs the flight of the bullet, and the grip supports the entire package. Action: The action is the operating mechanism of the handgun. Generally speaking, all the moving parts of a handgun make up its action. Action as it refers to trigger function is broken down into two primary categories: Single Action and Double Action. Any time you hear of an “accidental shooting” where someone was injured, the chances are good that more than one of the universal safety rules was broken. Firearms ownership carries with it the highest level of responsibility. Only by adhering to the above safety rules can we effectively minimize the chances of something or someone being shot that was not supposed to be. Everyday thousands upon thousands of citizens use firearms in a safe and responsible manner. 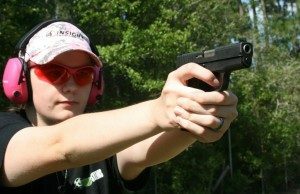 Understanding and following the rules is the reason for safe gun handling. After you’ve decided on your first gun, you need to purchase ammunition for it. Step #1: Always follow the manufacturer’s guidelines as far as recommended ammunition. Handgun ammunition can be found in Standard, “+P” and “Magnum” configurations. Ammo loaded at +P velocity has a higher pressure than standard rounds. Magnum ammunition has the highest pressures found in handgun ammunition. Higher pressure translates to better effectiveness downrange, but it also puts more pressure/felt recoil on the shooter’s hands and the gun. Most modern firearms are built to accept the pressures of +P ammunition but a steady diet of such ammunition may wear on the gun over time. NEVER attempt to load Magnum ammunition in a gun not chambered for such loads. 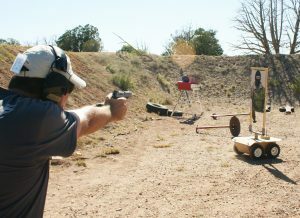 Unless you are involved in some type of precision marksmanship competition, your choices for handgun ammunition will fall into two broad categories: Practice (training) or Personal Defense. All ammunition manufacturers produce training ammo and defensive loads. A handgun cartridge is composed of 4 Parts: the case, the projectile or bullet, the primer cap, and the propellant powder. When a manufacturer produces a defensive load, one that the shooter will be using to protect their life, they use premium or more expensive components. A quality defensive load will have a controlled expansion bullet (hollow-point). These come in many varieties but all are designed to expand/open up when they strike something solid like animal tissue. The reason for this is two-fold, expanding bullets reduce the chance of the bullet passing completely through the target and they also will potentially do more damage to the target thus reducing the number of rounds it takes to stop the threat. 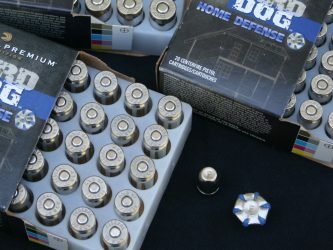 Some of the premium components in defensive ammo include nickel (silver) cases, sealed (moisture-proof) primers, and flash-reducing propellant powder. Because defensive ammunition is built from premium components it is naturally more expensive. In this case, you get what you pay for. Training or practice ammunition is purposely built from less expensive components. By using less expensive components the manufacturer is able to reduce the consumer cost and allowing you to shoot more for less money. 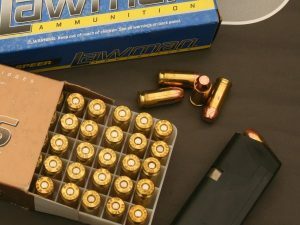 Practice ammunition will be loaded with full metal jacket (non-expanding) or solid lead bullets and the cases will be standard brass, lacquered steel, or aluminum. When it comes time to choose ammunition for your first gun, keep in mind that premium defensive ammo goes in the gun for that “just in case” moment. Less expensive training ammo is what you will take to a class or out to practice. If you are completely stumped as to what type – or brand – of personal defense ammunition to purchase, find out what your local police officer or sheriff’s deputy is carrying. That’s not a perfect answer but a good place to start. No one is born a good shooter. There are definitely natural athletes, but using a firearm effectively takes both mental and physical skill. Whether you have just purchased your first gun or have owned one for years, training and practice are the keys to proficiency and ultimately, success. 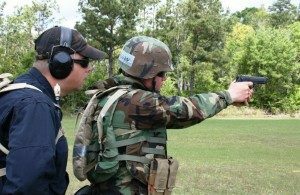 Although the two words are often used interchangeably, when it comes to firearms, training and practice are not the same. Training is something you do under the watchful eye of a competent instructor. From a practical standpoint, you cannot “train” yourself. Only an experienced instructor can point out the areas you need to improve and reinforce the areas you have mastered. For instance, you may have discovered during training that your first shot on target is often low and left. 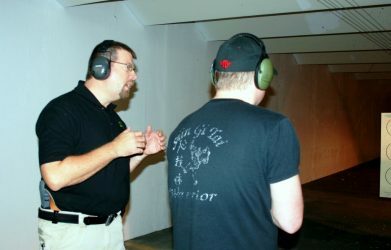 Your instructor explained and demonstrated a proper trigger press and front sight focus. You understand what you need to do; now you need to consistently apply that during practice. An often overlooked aspect of training and practice is the development of a genuine confidence in one’s own abilities. You cannot trick the mind or body. If you don’t have skill with a firearm, you cannot simply will yourself to have it. After you’ve experienced a professional training class or two, you will have a very real and genuine understanding of your abilities. Often, the improvement over a period of two or three days is dramatic. Few shooters will arrive unable to hit the broadside of a barn and leave with the ability to shoot tightly clustered groups. You cannot buy confidence, you have to earn it. Skill with a firearm is like any other physical skill, it is perishable. If you do not train and then practice regularly, you will lose that skill. Using a firearm for personal defense is serious business. If the time ever comes to defend your life with a gun you will not have time to “warm up” or “practice”. The skills you have mastered will be the skills available at the time of crisis. If you are stumped as to where to find professional training, you can always ask the clerk who sold you your gun. They should be able to recommend someone locally. If not, the Internet is full of information, jump on and do your research. How much training and practice do you need? Step one is to actually get some professional training. The more practical experience you gain, the better equipped you will be to answer that question. Hearing and Eye protection are a requirement not an option. The burning propellant gases produced by firearms are under high pressure and produce ear-damaging noise. This noise can and will damage a person’s hearing permanently. Hearing damage is incremental and builds up over time. When your ears stop ringing they are not “back to normal”. The ringing in your ears is a sign of hearing damage and over time can lead to Tinnitus or deafness. Tinnitus is a constant hum or ringing of the ears. Noise-reducing earmuffs are always preferable as they provide the greatest amount of protection. Ear plugs must be securely placed into the ear canal and form a sound-proof seal in order to be effective. 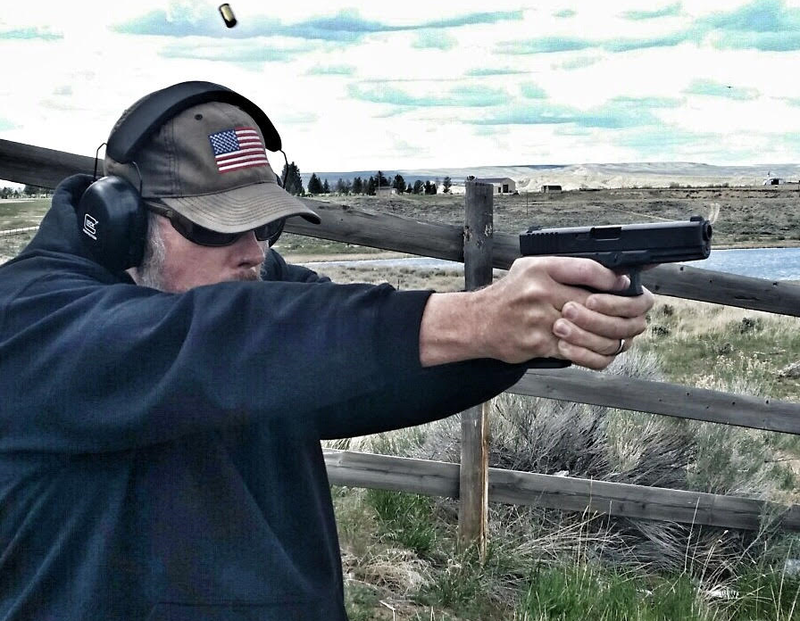 During practice or training in an indoor range or under cover, combining ear plugs and muffs is preferable. The burning gas, ejecting brass casings, unburnt powder, and fragments of projectiles all present a hazard to the eyes. Every person participating in firearms training or practice must wear some form of shatter-proof eye protection. Any person nearby or spectating must wear ear and eye protection as well. Ear and eye protection are relatively inexpensive. When compared to the cost of electronic hearing aids for damaged ears or surgery to repair damaged eyes, the cost is inconsequential. There is no excuse not to protect your vision and hearing. Always keep your guns clean, well-lubricated, and in good working order. Firearms are simply machines made from a combination of steel, aluminum, wood, and polymer. Machines function best when clean and well-lubricated. A byproduct of burning propellant gases is carbon. Over time carbon can build up on a firearm. Eventually the moving parts fail to work as designed. By design, firearms will include steel that is subject to corrosion or rust. The moisture in the air and salt produced by the hands and body of the shooter can lead to oxidation or rusting. Even guns that are “stainless steel” or treated with a corrosion resistant coating need to be cleaned and lubricated occasionally. Always follow the manufacturer’s suggested guidelines for care and maintenance of your firearm. Modern firearms are built to last a lifetime if cared for and maintained properly. Beware of storing guns in padded cases or “gun rugs”. These cases can trap moisture and hold it against the firearm. Store your guns in a cool, dry area. 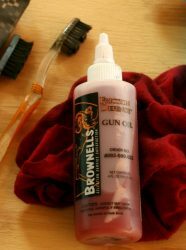 Numerous types of gun oil and lubricants are available and most will serve you well. Like the engine in your car or truck, any place where metal moves against metal should have a light amount of lubricant. You wouldn’t run your car engine without oil, would you? The same applies to firearms. *Caution: Keep live ammunition away from oil and petroleum lubricants. Gun oil can ruin the cartridge primers. If you suspect that a firearm has a mechanical issue, seek out the assistance of a qualified gunsmith or contact the manufacturer for guidance. Never attempt to “fix” a gun yourself unless you have the training to do so.